You are at:Home»Entertainment»Last stand for ABC's 'Last Resort' sub drama? ABC’s submarine-themed drama may be close to scraping bottom. 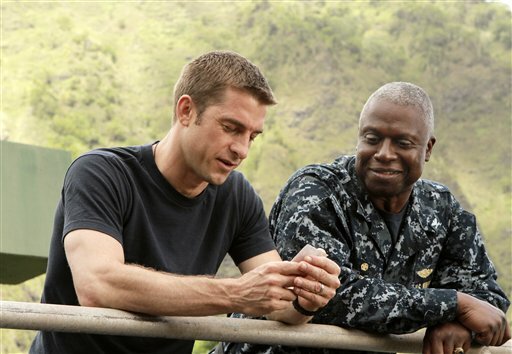 Fans of “Last Resort” — which features the crew of a ballistic-missile sub, nuclear warhead detonations, a fictional island in the Indian Ocean and a few treason charges for good measure — got good news last week when the network ordered two more scripts in addition to the series’ planned 13-episode run. But an extended script order isn’t the same as a renewal for a second season — it doesn’t even guarantee those extra shows will be produced. And it doesn’t address the show’s ratings slide: Thursday’s show scored a 1.3 rating and a 4 share in the coveted 18-to49-year-old demographic, down 0.4 points from the previous week. While the show has received a boost from viewers watching later thanks to their DVRs, the initial number brings back bad memories of the show that occupied the timeslot for ABC last fall — a remake of “Charlie’s Angels” that featured decidedly fewer nuclear explosions than “Last Resort” … and lasted seven episodes. The night before ABC pulled the plug on the female crime-fighters, “Charlie’s Angels” pulled a 1.3 rating and a 4 share. Based in part on numbers such as these, the ratings-trackers at TV by the Numbers have ranked “Last Resort” as “certain to be canceled.” ABC might give the sub crew a pass for this week — competition was tougher thanks to a World Series game — fans might want to start thinking about their save-our-show stunt of choice. I’m intrigued by the idea of Last Resort. I work at DISH when it airs, but I’ve been watching it on my Hopper (I’m one of those DVR numbers). It’s set to auto-record the big four prime time networks (including Last Resort) using Primetime Anytime, so I never have to worry about missing an episode. It sounds like it might not be on for much longer, though. The season started out strong, but it seems like they’re not exactly sure where to go with the story and the ratings are pretty low. Last Resort may have done better as a movie. I’ll be Thrilled when ‘Last Resort’, or as I call it, ‘Treason: The Series’ gets cancelled. Since ABC dumped LAST RESORT…… hopefully some other REAL NETWORK who values quality over the stuff that uninformed and uneducated kids watch. This was a great show…… sometimes the network need to set aside FINANCIAL GREED for programs with deep intellectual content.